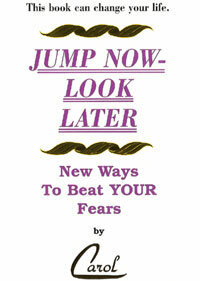 Success Now - Carol Pierce, Author / Success Coach / Louisiana Motivational Speaker / Motivational Speaker / Leadership Training / staff Development Training/Resume Writer / Professional Editor and Book Designer encouraging you to Jump Now! How Can Success Now Really Help You??? Success Now provides the know-how, the resources, and the encouragement to help your business, your organization, and you jump now to get more of the success you really want. First class, top quality work delivered in a truly professional, ethical manner that’s uniquely designed to meet your specific needs . . . that’s what you get! “You are electrifying with audiences and people are energized by your words” . . . that’s how Emmy Award winner Monica Pierre describes Success Now’s Carol Pierce, a frequent guest on many radio and tv talk shows and someone Pierre has often seen in action when the two have shared the same platform presenting motivational programs in various parts of the country. Which of these services do you need Success Now’s Carol Pierce to provide? Delivered in a flexible, enthusiastic, interactive manner when, where, and exactly how you really need those services, Success Now offers choices to fit your individual, small group, or large group requirements. Yes, Success Now programs qualify for CEU’s, and any topic selected can be custom-designed to fit your particular situation. Which Topic is a Critical Challenge You Need Addressed Right Now? Leadership Skills; Professional Development; Entrepreneurship; Effective Communications; Healthier Relationships; Personal Success . 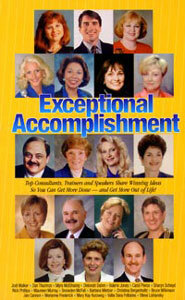 . . that’s a sampling of the diverse topics Success Now offers you. Discover how to successfully address your specific concerns with Jump Now Strategies based on Success Coach Carol Pierce’s lifetime of experience, training, and expertise as a master teacher, educational leader, community activist, as well as a successful entrepreneur, professional speaker, business leader, trainer, consultant, author, columnist, and individual coach. Turning Negatives into Positives Learn practical, eye-opening tips that will turn what seems so negative into actual assets that will help you achieve even better success. Becoming a Better Listener An extremely valuable training or motivational program for diverse organizations wanting their people to learn how to work better together, become better supervisors, provide better customer service, and even help increase sales. Thriving with Change Discover how to use change as an asset instead of an obstacle so you can achieve even greater success in your business or organization. Communicating More Effectively An extremely critical program custom-designed to fit your organization's specific communications issues surfacing at the time, especially if your business or organization wants to deliver more effective customer service and help your employees work better together. Note: This and all other Success Now programs qualify for CEU's when used as supervisory training, staff development, or leadership development programs. 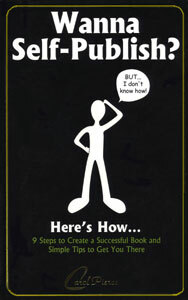 Creating a Book That Sells Itself Based on Wanna Self-Publish? Here’s How Discover the strategies Carol Pierce uses when successfully editing and designing professional-quality books, those very steps applied when working with 15 plus authors to create books on a variety of topics that people don’t want to put down. Creating a Resume That Works for You Instead of Against You Learn how to break the false beliefs about what really creates an effective resume. Discover how to make your resume finally start working for you. Find out how to become more focused when doing a job search and how to be better prepared for that critical job interview.